Interventionist Andy Bhatti Teams up With Calgary Flames Superstar Theo Fleury To Educate Families on Addiction & Trauma. 27 Nov Interventionist Andy Bhatti Teams up With Calgary Flames Superstar Theo Fleury To Educate Families on Addiction & Trauma. On December 9th Andy Bhatti, a Vancouver based Drug and Alcohol Interventionist, Calgary Flames Alumni Theo Fleury, Dr. Lacresha Hall, Marshall Smith Director of Partnerships at Cedars Cobble Hill Treatment Center and Devin McGuire the Executive Director of Revolution Recovery will come together to help educate families on addiction, sexual abuse and trauma. This event is 100% free. People that can afford to bring non-partible food items or a un wrapped toy for our charity food drive are welcomed to donate. Our charity food drive is in support of Sophie’s Child Advocacy Center in Surrey B.C. Andy Bhatti is a well-known Drug and Alcohol Interventionist and 2015 Courage to Comeback Award Recipient. Andy Bhatti has been working in the fields of addiction, sexual abuse prevention and interventions for many years. He is an avid public speaker, attending numerous speaking engagements about alcoholism, addiction, sexual abuse, and personal perseverance. He remains very involved with giving back to communities across Canada. Today, Theo defines himself as a victor over trauma and addiction, and a facilitator to those still trying to find their way. His best-selling books, Playing with Fire and Conversations with a Rattlesnake, encourage open sharing and provide practical tools that people seeking help can personally use. These tools are also useful to those who want to lead a productive conversation, called “Real Conversations”, with anybody else experiencing trauma. Marshall Smith is recognized as a national leader in the addiction recovery movement and Chair of the British Columbia Recovery Council. 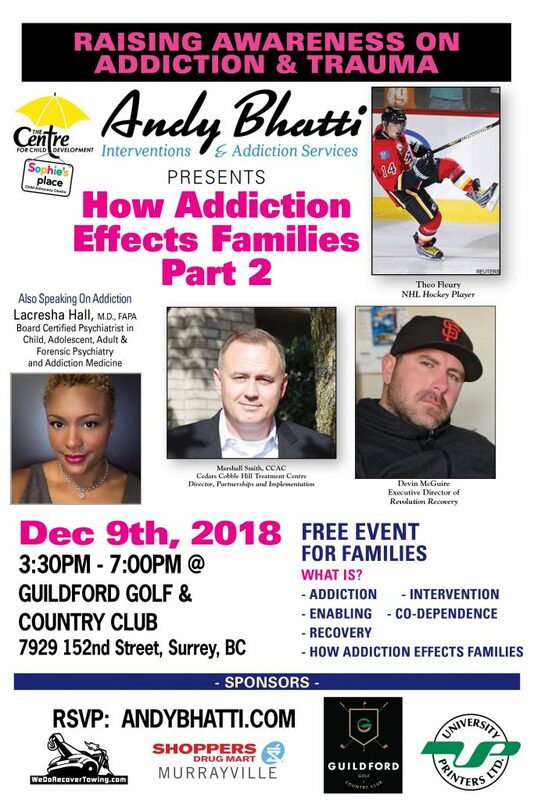 Marshall has held senior executive positions in the addiction treatment field most recently as the President and Chief executive Officer of Treatment Access British Columbia, Senior Advisor for Recovery Initiatives for the BC Centre on Substance Use and Executive Director of the Cedars Society. In 2004 Marshall fought a crippling battle with addiction that brought him all the way to the streets of Vancouver. After a four-year fight with addiction and homelessness Marshall rededicated his life and career to the field of Recovery. Since then, Marshall has developed several leading recovery programs in British Columbia and Alberta and lectures in programs on addiction recovery at UBC, SFU, UVIC, Royal Roads, Kwantlen Polytechnic University and Douglas College. Marshall is passionate about early intervention and improving standards of care for people with addiction disorders, their families and workplaces. Does someone you love suffer from addiction? We work with your family exclusively to support your loved one in a healthy recovery. Andy Bhatti Intervention and addiction services wants to guide you through the steps necessary to find recovery and restore a happy healthiness to your family. We can make the “long-term” difference in recovery.